Have you ever looked into the night sky and wondered what's really up there? I have. The universe is full of unknowns and maybe there's another planet out there similiar to ours. Have you ever wondered what it would be like to go there? Would there be life? Growth? People? And what if, somewhere out there, there was another you? In Another Earth, this all becomes a reality when a second habitabal planet, Earth II, is discovered. On the night of this ground-breaking finding, a tragic accident changes the course of two lives forever. Rhoda Williams (Brit Marling) is a brilliant student with a bright future, until vehicular manslaughter lands her behind bars. John Burroughs (William Mapother) is a promising composer whose life is irrevocably damaged when a hapless teen driver kills his family and puts him in a coma. Flash forward to four years after the accident as John and Rhoda are restarting their lives. Little do they realize, Earth II is about to bring them together in a way that neither could predict or ever comprehend. Another Earth revolves around Rhoda and John and the relationship they develop in the aftermath of the accident. Both, each in their own way, have become estranged from the world around them, mere shells of their former selves. She being wracked with guilt, decides one day to visit John and express her deepest regrets and sorrow. What she finds is a total mess of a man, and in a moment of weakness, she buckles. Instead telling him who she is and why she's there she can only offer, in the smallest of gestures, to help him clean up his life. Eventually, Rhoda becomes his salvation and John, hers. The two broken souls become involved in a torrid love affair until an unexpected opportunity leaves their relationship at a crossroads. Rhoda is now faced with the decision to tell John who she really is and what she's done. And if she does, can he still love her? Don't let the name fool you, because Another Earth isn't really about another Earth. Another Earth is about redemption, forgiveness and the impact of second chances. It's a powerful film that captures both the imagination and the heart. This little indie film was born of grandiose vision while simultaneously facilitating deeper introspection which renders this particular viewer at a loss for words. In short, I felt ALL THE FEELS. And let me be honest, it isn't an easy movie to watch. It'll punch you in the gut, leave you conflicted and wondering "what if?". The entire time I was stuck in a love/hate battle with Rhoda and her situation, but at the same time, I couldn't help but care about the poor girl. She's got a good heart despite some of the questionable choices she makes. By the end, you learn to not judge as you ask yourself "what would you do if you were in her shoes." Spoiler Alert: It's not an easy question to answer. A little more drama than sci-fi, Cahill has done the impossible in making us realize you don't need millions of dollars accompanied by a frenzy of CGI SFX to leave a lasting impact. Sure, the science is slightly questionable but it doesn't really matter because the whole Earth II thing takes a total backseat to the relationship between our main characters. Watching it blossom and bloom and whither is a tragically beautiful thing. By the end of the movie, left open to interpretation, the one thing we learn is that forgiveness and truth lay in the inner spaces of our hearts rather than an entire universe away. Another Earth is remarkable indie film full of heart and soul. It's one of those movies that makes you think and wonder "will she, won't she," the entire time. You're given more questions than answers but it's satisfying to be given the power to draw your own conclusions. Just make sure you have a box of tissues handy because it's emotionally jarring in a very profound sort of way. 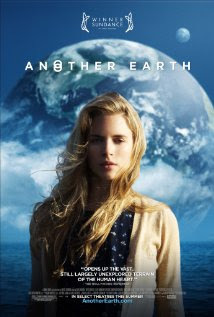 Another Earth sounds very good, I like drama mixed in with sci fi. I like that there's love in the plot too. Great post! It's such a beautiful movie, Naida! I was totally blown away. This will probably make my top fav movies for the year! I saw this movie was appearing on cable once and I was like, hmmmm. Should I? And I didn't and now I think I should've turned to it. I'm glad you enjoyed it, I heard good things about it from my friends, but this isn't usually my type of book. If you like very profound, deep movies then I think you'll like this. It's not as sci-fi as the trailer makes it look, so just be warned. Regardless, it's fantastic and understated and so beautiful.